Due to the health risks associated with mold exposure, it is best to have mold removal and remediation conducted by a certified remediation specialist, such as Rainbow International Restoration. Proper mold removal does not consist of using over the counter products that claim to kill mold. Because remediation is invasive, it is best to leave mold remediation up the certified professionals that are trained in handling hazardous materials. 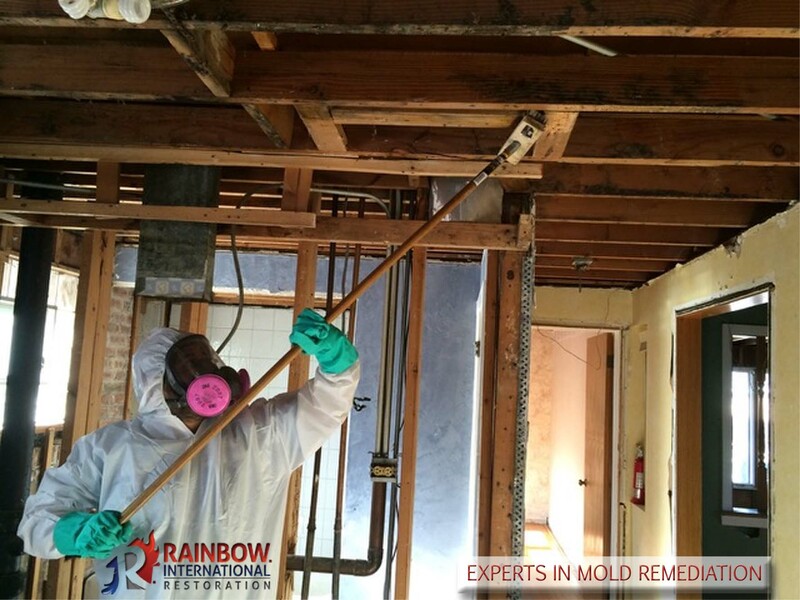 Rainbow International Restoration is the leading mold removal and remediation company in Chicago, Illinois. When mold is disturbed, it can easily spread through the air making it much more difficult to capture. These tiny organisms are called mold spores. Rainbow International Restoration’s mold removal specialists will isolate the work area to prevent the mold spores from contaminating other parts of the structure. Reducing the mold spore count in the air is just as important as removing the mold from building components. Rainbow International Restoration utilizes HEPA filtration machines to purify the air and reduce the amount of mold spores floating around. Mold is a living organism and can deeply ingrain itself into materials to survive. This is why mold must be physically be removed from the structure. Attempts to cover up mold on the surface will lead to contamination issues down the road. Therefore, the EPA does not recommend that you bleach as a means of mold removal. Mold removal and remediation always begins and ends with meticulous HEPA vacuuming to capture mold spores from surfaces. Stain removers are often used to eliminate or reduce mold staining. EPA registered antimicrobials are applied to all affected areas to prevent the mold from returning. Following remediation, a thorough post completion inspection is conducted. Rainbow International’s mold remediation specialist bring in an outside lab to perform a clearance test. This ensures that the spore count inside the structure has been reduced and has returned to safe levels for a fungal ecology within an indoor environment. Crawl spaces are as vulnerable to mold growth as any other part of your home due to the high humidity and moisture levels that are often found in these spaces. There are many contributing factors that can lead to mold growth in your crawl space. Contact the mold removal professionals at Rainbow International Restoration to assess your crawlspace and remediate the issue. Microbial growth, better known as mold, can grow anywhere as long as moisture, oxygen and an organic material for it to feed on is present. Microscopic mold spores float around the air and begin to cluster and grow on surfaces when moisture is introduced to the environment. There are over 1.5 million species of mold in the world, however, only about 100,000 have actually been identified. Mold can grow just about anywhere, but all strains have something in common. They all grow as a result of a moisture. If you suspect mold or moisture issues in your home, do not ignore them as they will only get worse with time. Protect the health of your family by contacting Rainbow International Restoration at (708) 460-0911 to set up a mold inspection. We understand that most mold issues are not covered by insurance. Because everyone's financial situation is unique, our company has partnered with a distinguished finance company to offer you financing options that can cover the cost of your mold remediation. With financing options ranging from fixed rate installment plans with low minimum payments to plans with no payments and free interest (if the total is paid during the agreed time frame), you will not find a better value than choosing Rainbow International Restoration for your mold removal project. Contact us today and ask how our price match guarantee applies or how you can apply for financing.